NOTE: It appears that you have cookies disabled on your internet browser. To use our website, please enable cookies either in general, or for this website. Consult your web browsers HELP file to learn how to do this. 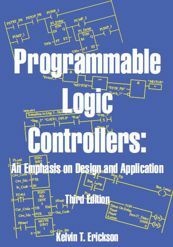 This book presents a comprehensive treatment of programmable logic controllers (PLCs) with an emphasis on program design. This text stresses an organized approach to developing PLC programs - "Given a set of operational specifications, how does one develop the PLC program?" This book develops the design process: the tasks involved, breaking the program into manageable pieces, standard code for the various parts, and handling the sequential parts of the problem. The book contains 75 example problems demonstrating good design practice and culminates in two full-length case studies. There are more than 250 homework problems and the text is illustrated with over 1000 figures. Due to its popularity, ladder logic is employed in the majority of the text. However, the text also comprehensively covers the other four IEC 61131-3 languages: function block diagram, structured text, instruction list, and sequential function chart. These languages are covered for five PLCs: Rockwell ControlLogix, Rockwell SLC-500, Siemens S7-200/300/400/1200/1500, Modicon Unity, and GE. Due to the Supreme Court ruling requiring online businesses to collect and remit sales tax to each state, we can only accept orders from individuals living in the state of Missouri. Individuals from other states must order our book from Amazon.com. We accept wholesale orders from bookstores in all states since the bookstore is responsible for collecting and paying their state’s sales tax. The third edition primarily updates the Rockwell and Siemens controllers and reorganizes the order of the processors, but there are other changes throughout. The order of the processors in the text has changed to be according to their approximate market share in North America: Rockwell, Siemens, Modicon, and General Electric. The Rockwell PLC-5 has been removed, but the MicroLogix and SLC-500 processors have been retained. The Siemens S7-1500 and the recent Step7 Portal programming software has been added to the Siemens sections. The Modicon M580 processor has been added to the Modicon sections. Information on input and output buffering has been added to Chapter 2. The section in Chapter 6 that presented transition logic for PLCs that do not have set/reset or latch/unlatch coils has been omitted. In Chapter 17, the P-Net, Swiftnet and Seriplex networks have been removed. Chapter 18 has extensive updates to reflect recent developments in operator interfaces, called "High Performance HMI." This chapter also uses color in the figures illustrating HMI concepts. Chapter 19 is updated for the newer industrial control systems security standards. The multi-unit chemical process in Chapter 22 is now larger. All of the chapter problems have been replaced with new problems.